This is so very very true. I work in a field where administration is paid bonuses for cutting costs – but the people who pay the price are the patients, because most of the costs are in staffing. Found this article while looking for something else, and I thought, this fits right in with my attitude towards the BS “jobs jobs jobs” mantra we are constantly fed, so I’m reproducing it here in its entirety. Enjoy…. As a Pagan, this is my Holy Day. It is the shortest day of the year, the longest night as well. Yesterday, today, and tomorrow the sun will seem to have been hovering in the same low spot in the sky; after tomorrow it will be incrementally climbing higher in the sky, bringing more light and eventually warmth with its rays. Holly still reigns supreme but today he will lose his battle with Oak. The deciduous trees will leaf again, roots will seek ever more deeply and widely in their quest for nourishment. Holly will be there, green as ever, waiting his turn once again to be the ruler. The epic battle for supremacy will once again play out soon, all to soon, at the Summer Solstice. And yet, as the earth needs time to rest and recuperate, so do we, those who grow our own food. The rush of summer, endlessly preparing for winter, is exhausting. When Holly wins the battle once again, we know we too have a rest in sight. Time to enjoy our labors, the fruits of the Mother, will soon come. All seasons are blessed, even when death is in the cards, for death too is sacred and a part of the endless dance of the seasons. The promise of a new spring, a new summer lays in these three days of breathless waiting….waiting for the return of life to the Mother. 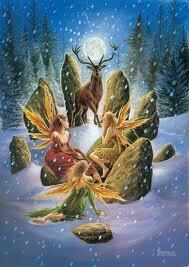 May you have a blessed Yule! Hand spun hand knitted sweater for someone in Maine. I love this pattern! 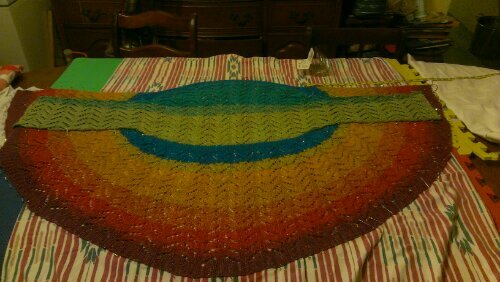 I will definitely knit this one again for other deserving people including one for myself. At minimum wage and materials this sweater costs over $600 (before taxes of course). What Is The TPP? A Primer. Wake up conservative Americans, the TPP is the enemy not the UN agenda 21 right now!!! I tried to reblog this from Damn the Matrix but it wouldn’t keep the formatting correctly, I’m making sure I give credit for it. Obama is PUSHING THIS to be done as soon as possible; he wanted it signed by the end of December but it’s likely it will be put off until the first part of January. WRITE YOUR CONGRESS PEOPLE AND SENATORS PROTESTING THIS ABORTION OF A ‘TREATY’ THAT PUTS AMERICAN JOBS, FREEDOMS, AND NATIONAL SOVERIGNITY AT RISK!!! Don’t let Obama ‘fast track’ this through which means that our elected representatives have to sign it AS IS or reject it – and they’ve NEVER rejected a treaty that’s been fast tracked, EVER. Wake up, people. Putting corporations before people is making the big leap with this treaty. No more government regulation of corporations, no more environmental protections, no more public utilities, no more public health protection, no more rights as we know them. Don’t think it couldn’t happen here; this is one of the things having sanitation regulations, regulations, and sanitary workers/facilities prevents. The Black Death Is Back…?! | Zero Hedge. Not since the Middle Ages has the bubonic plagues taken so many lives in a year. Having wiped out 25 million people in Europe, appearances of the Black Death since have been rare but the Red Cross is reporting a new outbreak has killed more than 20 people on the island of Madagascar. Living standards in the nation have collapsed since 2009 (what else happened in 2009?) and the prevalence of rats has helped spread the disease easily. While China claims to have the bird flu under control (despite some rumors out of Hong Kong), the Red Cross warns there is a risk of a Black Death epidemic. I worked on the second part of my post about Libertarian/conservative/Republican ideas and how history shaped the laws they hate, but I found myself going off on tangents. I don’t know that I am fond of tangents, but I don’t think linearly and ending up on a tangent is more often than not where I’ll find myself when doing any sort of research. I like history: reading about it, watching documentaries on it, reading actual historical documentation whenever I can get my hands on it. It doesn’t matter if it’s medieval history, pre-history, Renaissance, I get insights from it all. I also enjoy participating in demonstrations of skills no longer common, and in experimental archeology types of activities. It gives a very different perspective on the people and the societies of the past when you actually learn to DO what they did every day, in the way they did it. Please be patient, they are coming….